Sydney is hot! Flew in wearing tights, jacket, boots. As soon as I checked myself into the hotel for the week, everything came off to be replaced by a simple pair of sandals. Had I moved to the wrong city? We still have our gas heating on in Melbourne, even during the day! 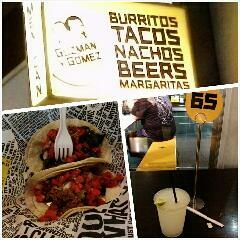 The first evening in Sydney, I treated myself with some tacos and frozen margarita. The filling could have had less juice, it was running all over my hands by the time I finished, but the vegie and pork chipotle soft shell tacos were good and more than I could fit in my not-so-small-anymore stomach. Or maybe still small. The classic margarita was my favourite though. I get so thirsty!